Suggested Retail Price £29.99. Distributed in the UK by Creative Models. The AAVP-7A1 RAM/RS (Amphibious Assault Vehicle Personnel / Reliability, Availability and Maintainability/ Rebuild to Standard ) is the latest incarnation of the USMC’s amphibious APC derived from the original LVTP (Landing Vehicle Tracked personnel) 7 which entered service in the early 1970’s. The AA7 is the backbone of the USMC’s AFV inventory and serves as an APC, Command, Engineering Vehicle, recovery vehicle, resupply vehicle and whatever other roles the USMC allots it. 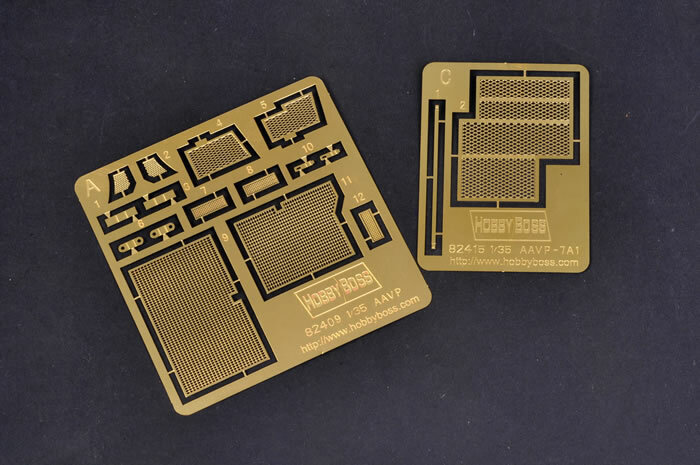 The AAVP 7A1 /RAM/RS is a more cost effective solution than buying new vehicles and is a much improved vehicle over the earlier AAV7 and LVTP7. It has the modified suspension and powertrain of the Army’s M2 Bradley which significantly boosts its performance which suffered from the weight increases from the previous improvements. The previously upgraded vehicles had a ground clearance of 12” down from the designed 16” which affected their mobility. The RAM/RS lifts the vehicles Power to weight from 13 – 1 to 17 – 1 and raises the ride back to 16” ground clearance. An ID feature of the RAM/RS vehicles is the Track and suspension with updated vehicles now having return rollers for the track as per the Bradley. From the original Turret mounted M2 50 cal the vehicle now has an Up Gunned Weapon Station in the form of the Cadillac Gage Weapon Station mounting a 50 cal and Mk 19 40mm Grenade Launcher supported by improved day/night sights. This is not a specific RAM/RS feature but the Optics and fire control have been improved. Additionally the vehicles have been updated with modern Communications, optical and navigation systems. Whilst not as well armed as the Army’s Bradley the AAV7 still packs a punch in support of its dismounts. 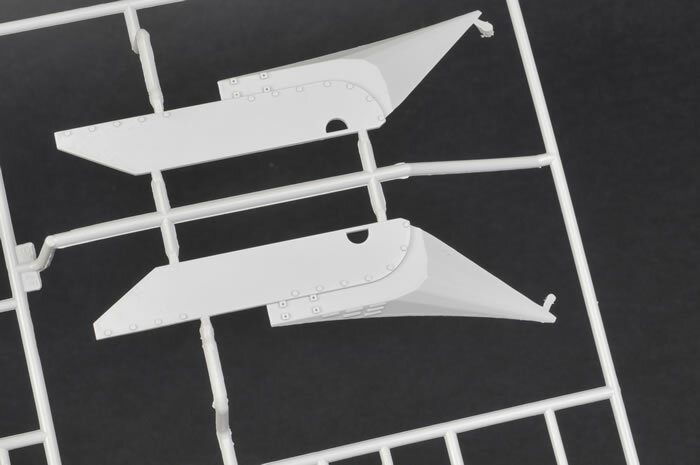 The vehicles have mounting points for the bolt on EAAK (Extended Applique Armour Kit) when required which when fitted significantly improves the vehicles survivability. 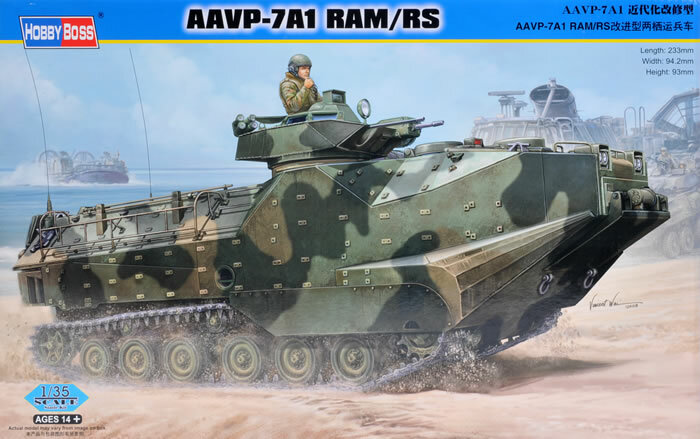 This is an all new kit of the latest USMC variant the AAVP7A1/RAM/RS but does not come with the add on external armour package, which will be a later release kit to go with the LVTP 7 , LVTP7A1 and AAVP 7 –A1 kits also released by Hobby Boss. 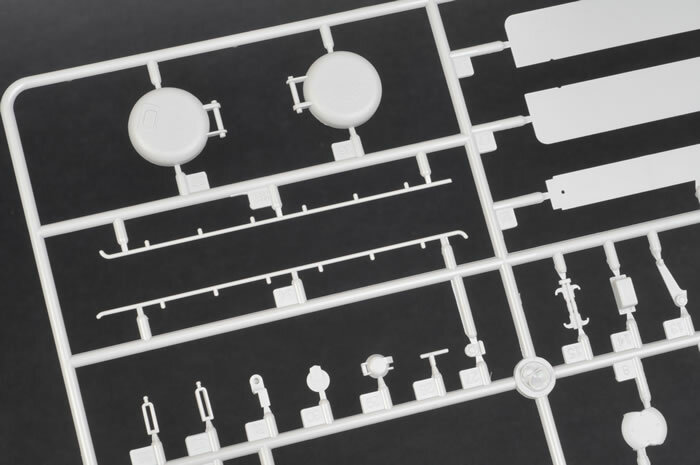 The kit has no commonality with earlier Trumpeter copies of Tamiya’s late 1980s LVTP7A1 kit. It is in a league of its own. Like the real deal, this is a massive product improvement and an awesome kit which fills its large box (try getting it back in!). 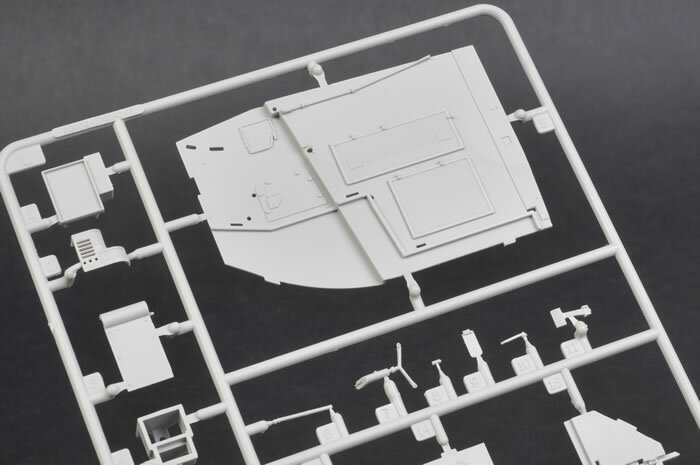 Unlike its Academy and Tamiya predecessors, this one steps out and offers a well-detailed interior to fill its cavernous body. 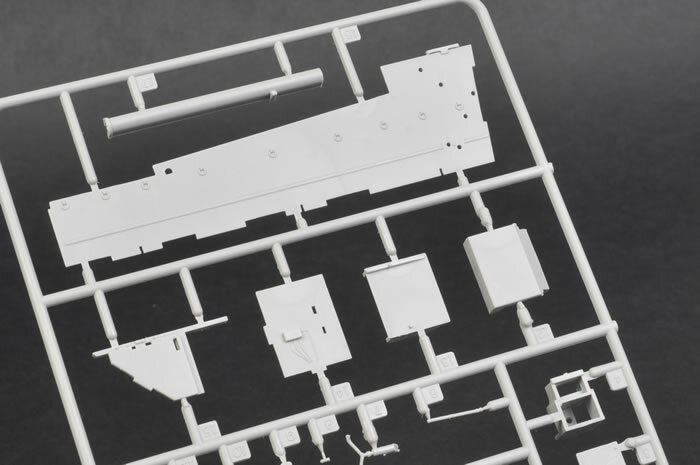 The package contains approximately 820 parts, so is not a simple kit and due to the complex and detailed interior it will need a careful build plan with painting as you go. The interior is fairly complete and includes a fully detailed turret with basket. I noticed some items missing such as the radios but the empty rack is provided! 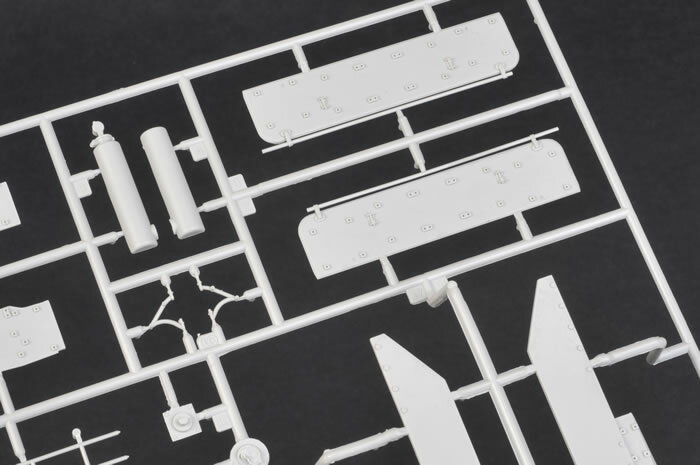 The kit comes well packaged in a very sturdy box with the one piece upper and lower hulls and detail parts enclosed in their own divider and the rest of the parts wrapped in the usual individual plastic bags with the Instruction booklet and coloured painting & markings guide. There are approx 820 parts (360 are the tracks) all crammed into the box. 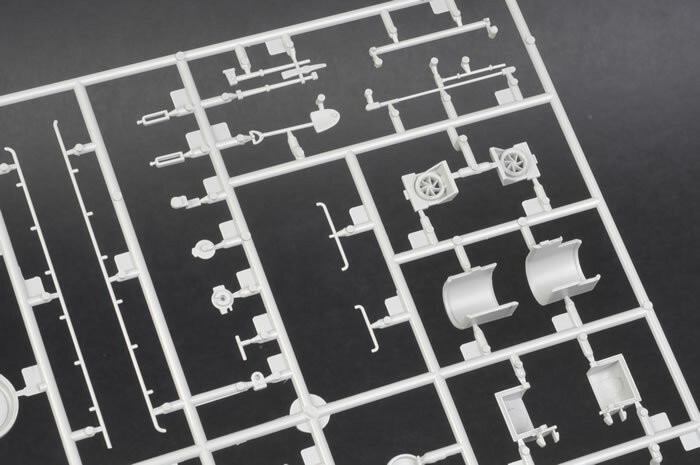 The instructions are clear, concise and follow usual Hobby Boss layout with a view of sprue layout as is the norm these days. These are confined to two folding sheets of four pages (front and back) in A5 size. I think that it would be better if the instructions were offered in an A4 booklet as some of the diagrams are a bit small. The build is broken down into 16 Stages with 1-9 having you assemble the lower hull including the interior. Steps 10-14 have you assemble the upper hull. 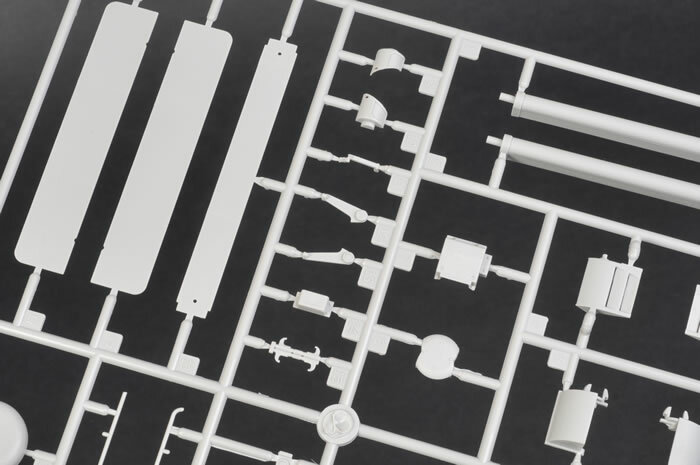 Step 15 deals with the Cadillac Gage Weapon Station and is a complex kit in its own right comprising nearly 70 pieces including transparencies. The ramp and trim vane are added in step 15 along with the assembled turret with basket to complete the kit. I disagree with the method of construction and would recommend building up to Step 11 then painting all the interior detail of the lower and upper hull. No real guide is provided for painting the interior and be aware there are small decals to be added throughout the interior. After this is done I recommend attaching the upper hull to the lower, which is a bit fiddly, before applying the next 3 stages of detail to the upper. The shape of these vehicles is quite complex and the hull is split horizontally along side joins in the upper plate. It is fiddly fitting the hull top in and I recommend gluing it in stages with tape to hold the upper in place as you go. This has been the same with both the Tamiya and Academy kits before it. 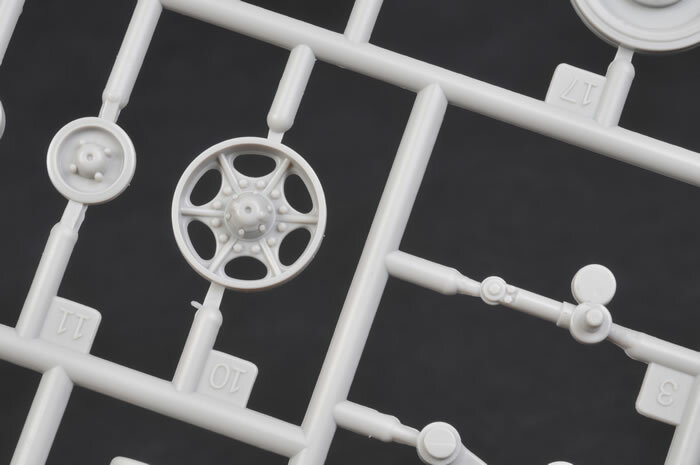 The kit supplies the road wheels as two parts each and these are sharply detailed front and back. 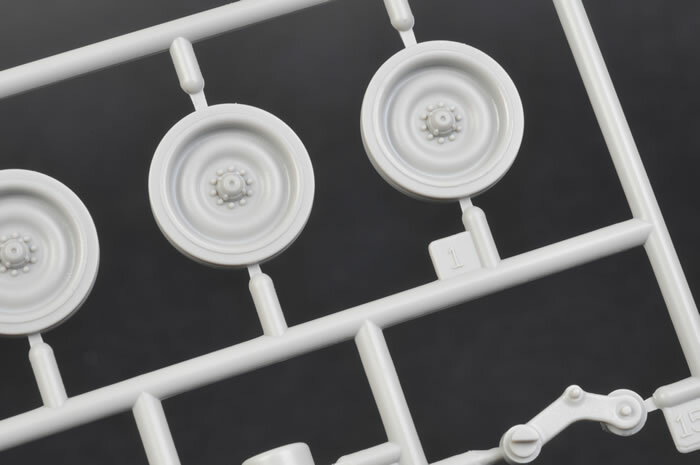 The idlers and sprockets are superbly detailed with the correct lightening holes and offset spokes in the idler. Even the small return rollers are two-part and detailed. 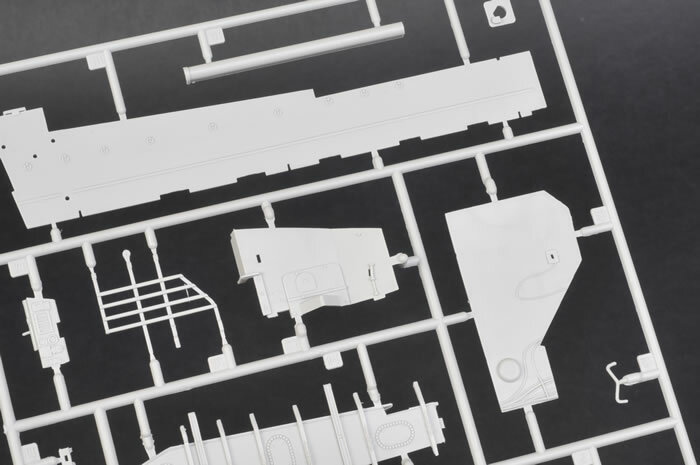 Suspension arms are supplied individually and with a little work could be articulated to suit. Separate shock absorbers are also supplied. The instructions can be a bit confusing so take your time. The tracks links are two parts (link and pad) like the real thing and 84 are required for each side. Detailing of the lower hull walls starts building sub assemblies which will aid in painting. It begins with adding hosing, conduit and seats to the wall of the driver’s compartment, which is the first sub assembly. Sub assembly DD makes up the left hand lower sponson walls and note you have to open up holes for the seat supports. 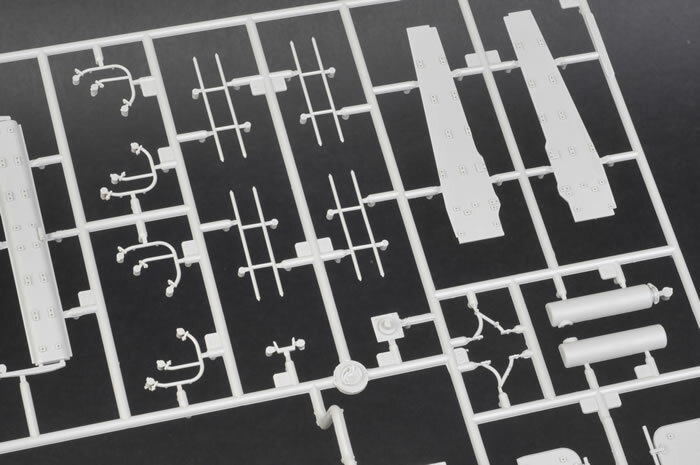 Assembly FF is the wall of the gunner’s station and the easiest sub assembly with two parts. The central floor tub should pose no problems but I would personally recommend painting this and its troop seats prior to putting it in the hull. The same could be said for a lot of these assemblies. Additional Racking and the vehicle Toolbox is added to the left wall after DD is affixed. 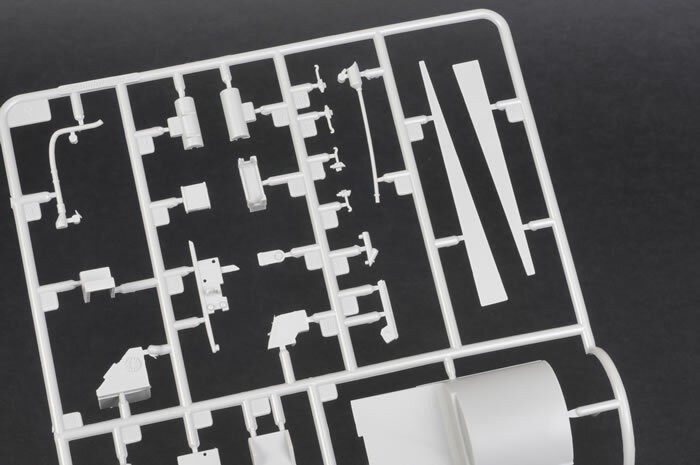 The right hand rear wall up to the Gunners station is next and again is made up of lots of little assemblies which would benefit from painting prior to assembly. Step 8 starts us on the driver’s compartment right hand walls and the engine bulkheads. Note there are quite a few decals throughout this process. 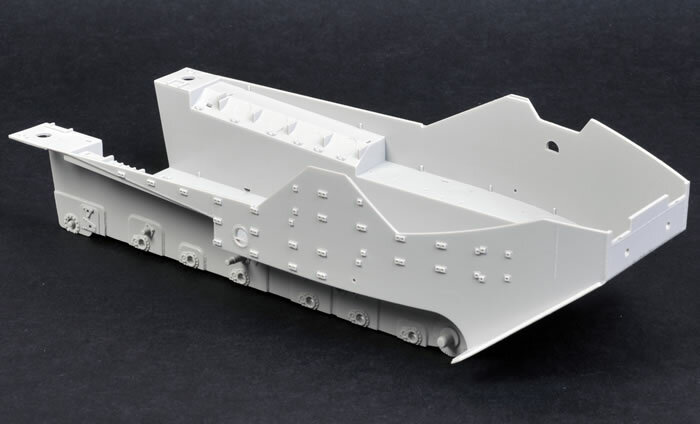 Steps 9 & 10 deals with the outer hull panels covering a lot of the track run so ensure these areas are painted prior to assembly. It also has the upper hull interior walls which are affixed to the roof panel after assembly. 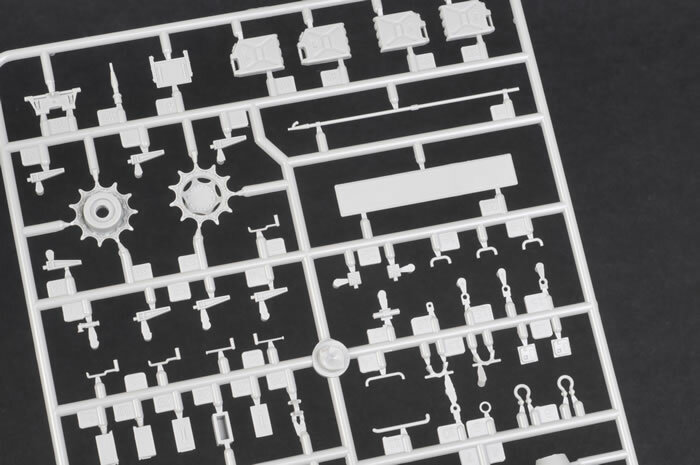 Hobby Boss has included a lot of internal detail so take your time and paint as you go. Step 11 is where I differ from the instructions. This is where you start detailing the roof /upper hull panel as a separate assembly to be added later. I recommend detailing the inside and painting it and then affixing to the lower hull before you start detailing the upper hull. I must admit there are nowhere near as many parts to the outer hull detail but it is well done with workable hinges on the large topside cargo hatches. The ramp is covered in Step 14 and like the real thing is of sandwich construction with a separate rear combat door supplied. No real problems here. 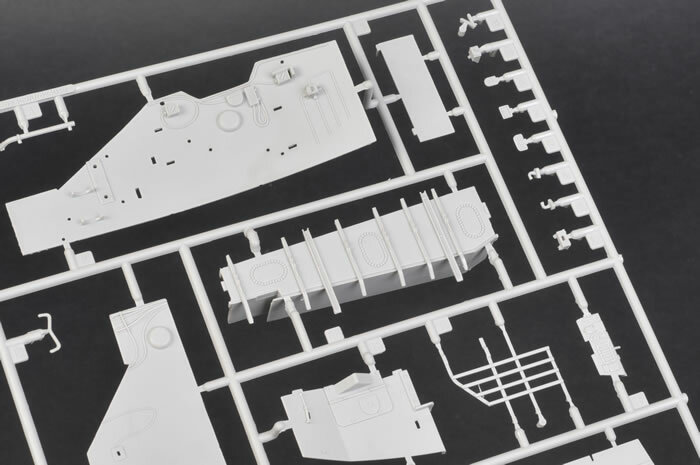 The turret assembly involves nearly 70 parts and is very well detailed with ammunition feed and collection chutes supplied along with ammo tins and the various fire control panels. 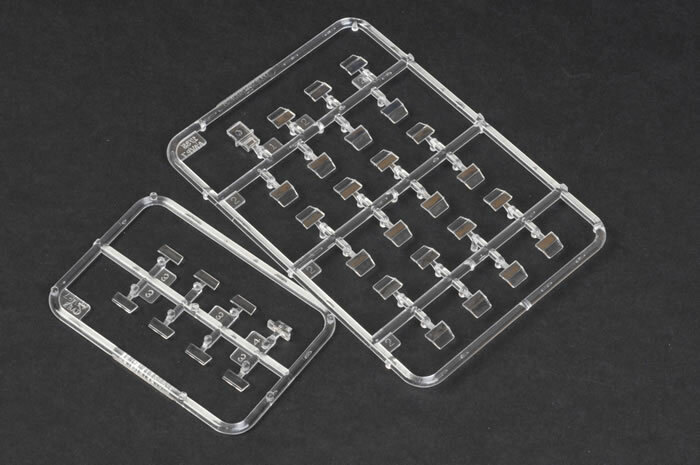 Clear vision blocks (7) are supplied. The smoke discharger assemblies are a five part unit attached to the turret rear with PE. I was not impressed with the attempts to replicate continuous tie loops along the turret upper and lower edges. It looks like a sawtooth when assembled would be better replaced by PE parts. The kit is finalised in step 16 by adding the trim vane, ramp and turret. A small piece of nylon thread is supplied to use as the ramp cable if you wish to display it dropped. It will be quite a challenge to get this at the right tension – good luck. 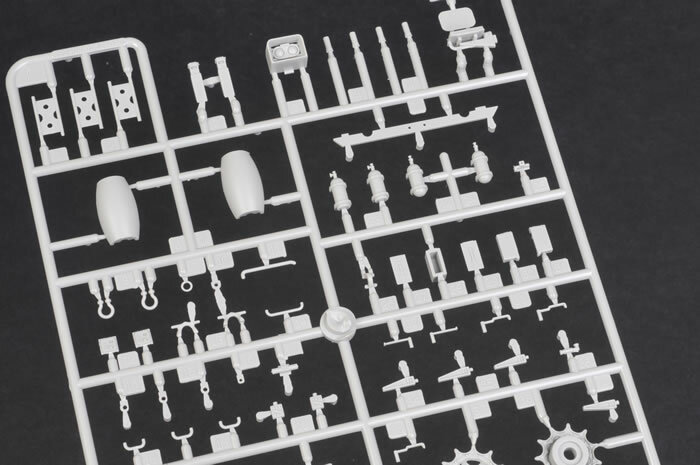 The kit parts are flash free and quite crisp with most ejector pin circles in out of the way places. 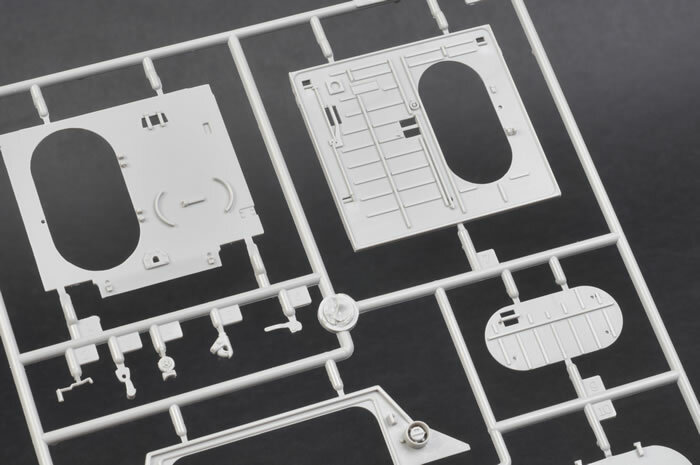 The interior has a lot but they are covered by interior panels in the main (well done Hobby Boss). Weld seams are extremely well done and realistic as are the clear moulded vision blocks. The external jerry cans were very well done and have photo-etched racks and straps along with separate handles. These are about the only external stowage included. Photo-etch is provided for the various deck grilles and exhaust cover as is the norm from this manufacturer. 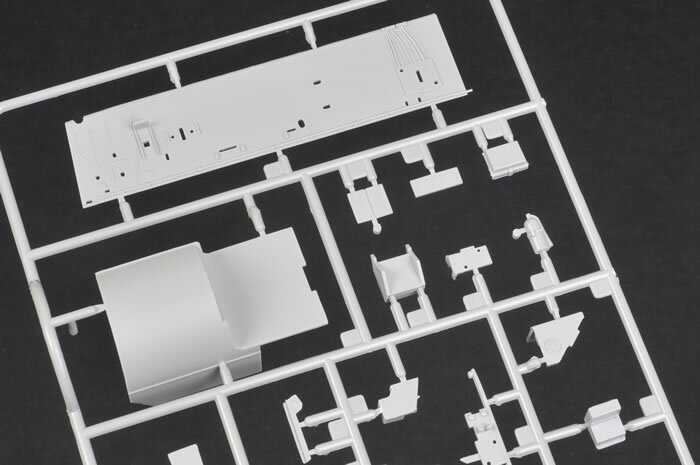 One thing not provided (which has been in the past) is the self-adhesive masks for the clear parts. This is a pity as there are quite a few in this kit (32 vision blocks). 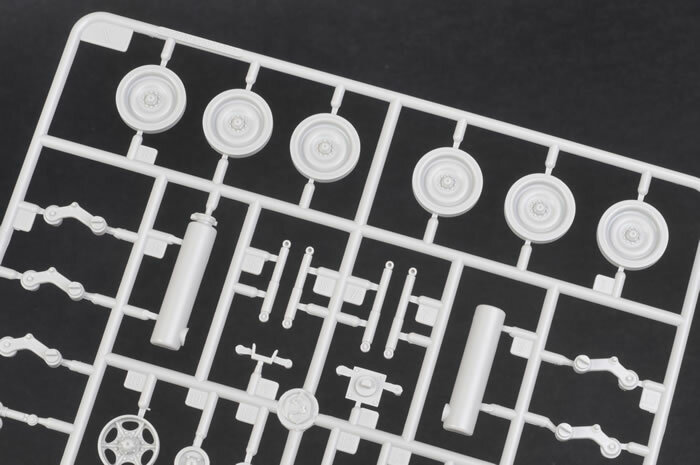 One thing that puzzles me with this is that the CC Turret has continuous tie down points along its edges which Hobby Boss have tried to mould into the turret which doesn’t really work to my tastes. I don’t think the purists will like this but the average punter should be fine. It would have been better to include this as PE like the set available from Mouse House for the ASLAV. 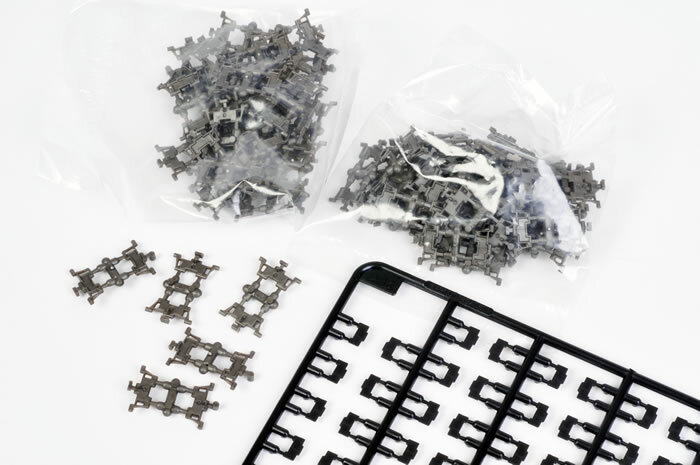 The tracks are beautifully moulded (with no sink or ejection pin marks visible) in a metallic grey and separate pads are supplied in black plastic. Beware the carpet monster when assembling. The decal sheet is small with a lot of minute stencil information and warning / instruction placards for the interior. It offers two sets of marking – a Forest Green Italian option and a NATO three Colour USMC version. No unit information is provided regarding these options. The USMC example does not appear to have any tactical or formation markings. It has a Corps insignia on the nose and a small white registration number on the rear. It has ten small external markings with the majority being minute (and I do mean minute) stencils on the rear and upper hull. Colours recommended are Mr Hobby, Model Master, Vallejo, Tamiya and Humbrol (where suitable colours are in those ranges). I note only Mr Hobby, Model Master and Humbrol are listed as having all the colours. They only list Tamiya for the Black and the Italian Green. This kit is so far ahead of its predecessors its not funny. Apart from representing the latest RAM/RS version currently being fielded by the USMC and Italy it offers, for the first time, a comprehensive interior with the kit instead of as an aftermarket item that costs more than the base kit. 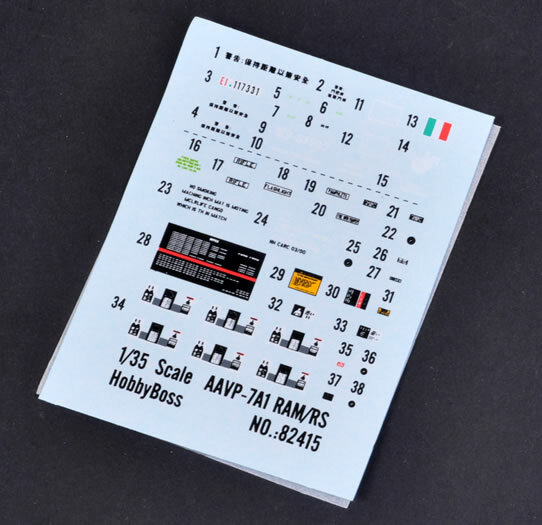 Hobby Boss has delivered detail the equal of its top line competitors and at a similar price to a current DML kit. For such a huge subject with such detail that is excellent value for money. 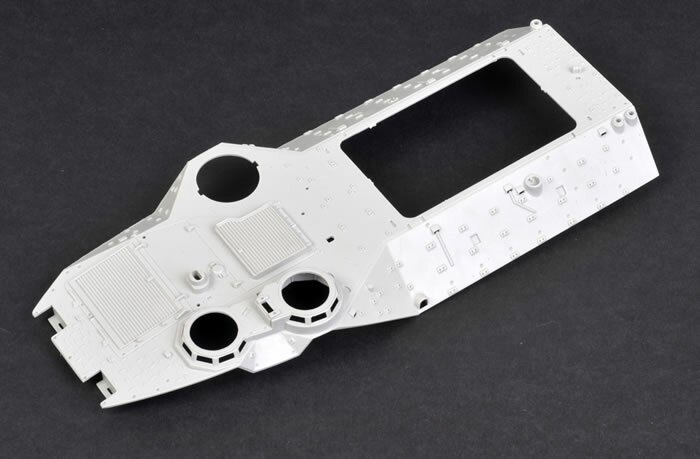 Hobby Boss has done its homework but, like all kits, it still has areas to improve such as elements of the internal stowage (radios and the driver’s night sight stowage missing). I believe that more thought could have gone into the instructions (larger) and the colour guides should have been included for the interior. Additionally, photo-etch for the turret tie down arrangement would have been preferable to the moulded-on arrangement. If you want to build a kit of a “Tuna Boat” (as the USMC affectionately refers to them) then this is the kit for you. Even if you don’t want to build a vehicle with interior it is still much sharper and up to date than the Tamiya offering. Hobby Boss might have added some improvements, but I feel that could be said for any kit, and this is one of the most complete modern kits that I have seen in this scale. The fact they are doing the whole family of the LVTP 7 / AAVP 7 is an added bonus. Thanks to Creative Models for the review sample.